The growing massive involvement of the Russian troops on the Romanian Front in the first part of 1917 led to a hierarchical reorganization at the upper level of leadership of the Romanian and Russian armies on the Moldavian front. 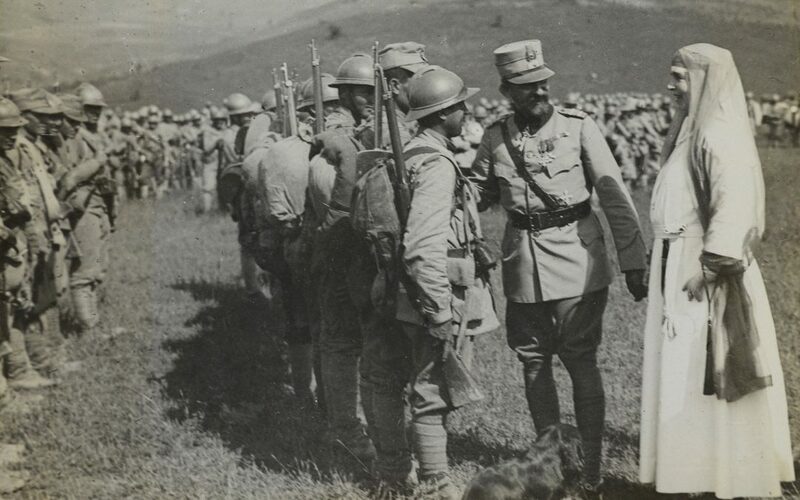 Even though it hesitated to intervene vigorously when Romania entered the war, Russia saw itself constrained at the end of 1916 to do so because of the evolution of the Romanian Front and had to send reinforcements to Moldavia. More than 36 infantry and 11 cavalry divisions, representing 23% and 37% of the Russian forces on the entire Eastern Front, from the Baltic to the Black Sea, reached the Romanian frontier. As a consequence, the Russian army was stretched thin and was not able to carry offensive actions elsewhere. Following the concentration of more and more Russian troops on the Romanian Front, the Russians insisted on playing a central role in the planning of military operations. The Russian high command, the STAVKA, wanted the Romanian army to be incorporated into the command of the Russian army. Political and military decision-makers in Romania did not even want to discuss this option and insisted that the Romanian army and its high command be completely independent. Emperor Nicholas, cousin to Queen Marie of Romania, respected the Romanian desire. Thus, King Ferdinand was the leader of the Romanian Front of the Allied armies, which included the totality of the Romanian and Russian forces from Bukovina to the Black Sea. He had two aides: a Russian general and a Romanian general with the Russian General commanding the Russian troops. In April, the Russian troops on the Romanian Front had a new commander, General Shcherbachev, who worked closely with Romanian authorities. Romanian command was also reorganized. General Iliescu, the Chief of the Great General Headquarters, was replaced by General Constantin Prezan. Iliescu’s request to remain as a deputy or to give him command of a unit on the front was denied by King Ferdinand. Instead, he was sent away to Paris as a liaison. The election of Prezan was surprising at first glance, after his failure at the Battle of Bucharest. The most plausible option, Romanian general Alexandru Averescu, was nonetheless unacceptable to those who made the decision: King Ferdinand, Prime Minister Ionel Brătianu and French general Henri Berthelot. They had a bad relationship with Averescu. Instead, Prezan had a common past with Brătianu since they were both in Paris, he was praised by Berthelot as “the only soldier here who is truly capable”, and was also supported by Queen Marie. On the other hand, despite the defeat of the Battle of Bucharest, Constantin Prezan, demonstrated his qualities during his command of the Northern Army and then of the Southern Army Group. Chosing Prezan would prove beneficial in time. He had the character and the personality that were needed in those moments, more so that the “arrogant” Averescu. Averescu was rightly frustrated with the appointment of Prezan, which would affect Averescu’s relations with the Great General Headquarters. There also was a reshuffle of unit commanders. Almost all division commanders were changed, being replaced by officers who had distinguished themselves in the 1916 campaign. After the reorganization of the Romanian army, combat forces reached almost 400.000 men.